Общий вид Артвина c местечка Свет. 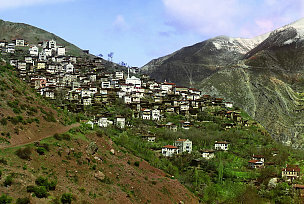 General view of Artvin from the hamlet of Svet. 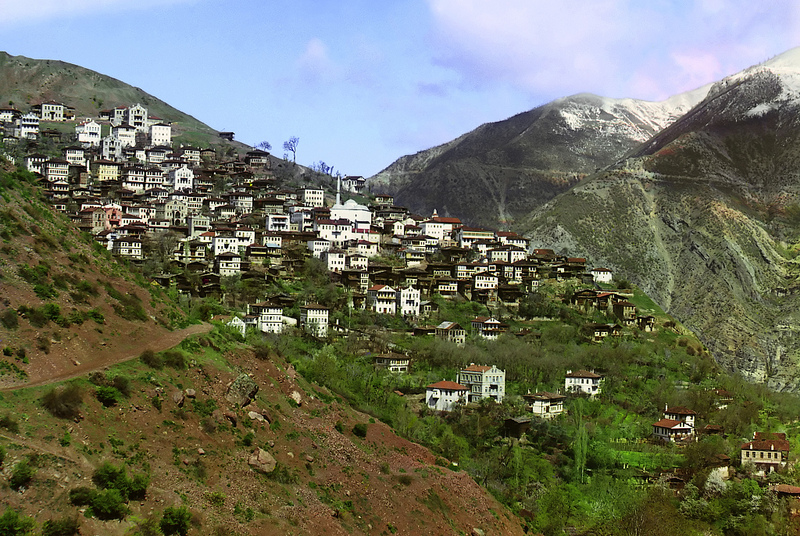 Artvin is a small city on the Coruh River, 55 km south of Batumi. Today, this area is in Turkey. Library of Congress, Prints and Photographs Division, Prokudin-GorskiiCollection, LC-DIG-ppmsc-04844. Digital color rendering by Walter Frankhauser. Mullah with schoolgirls at the Artomelin Mosque in the town of Artvin. Mullahs are Islamic clergy, who have studied the Qur'an, Islamic traditions (hadith), and Islamic law (fiqh). Often, they will know the Qur'an by heart. However, illiterate villagers sometimes recognized a literate Muslim with less than complete Islamic training as their “mullah”. Muslim schoolteachers were often considered mullahs. Library of Congress, Prints and Photographs Division, Prokudin-GorskiiCollection, LC-DIG-prokc-21486. Digital color rendering by Jan Hubička based on color composite by Blaise Agüera y Arcas. Kurdish woman with children. 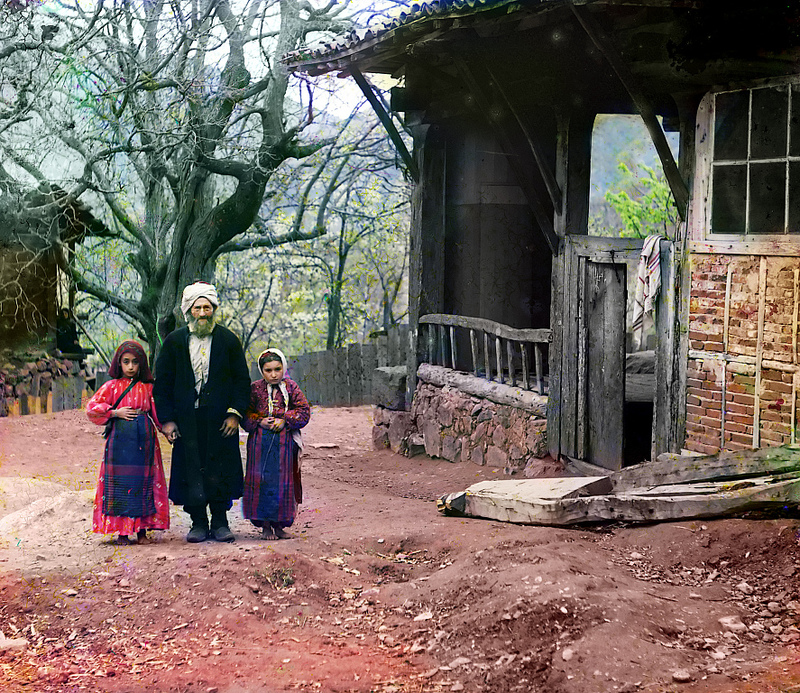 Artvin. Library of Congress, Prints and Photographs Division, Prokudin-GorskiiCollection, LC-DIG-prokc-21470. Digital color rendering by Jan Hubička based on color composite by Blaise Agüera y Arcas. 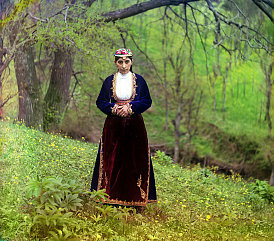 Armenian woman in national costume. Artvin. 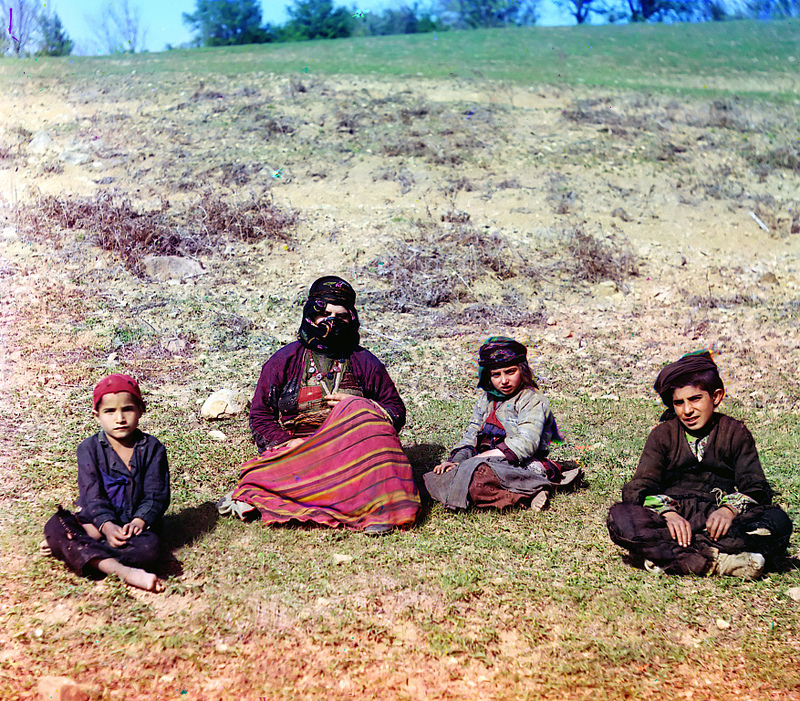 One hundred years ago, Artvin was located in Armenia, but is now part of Turkey. The Armenian woman's dress pictured here distinguishes her as being Christian. 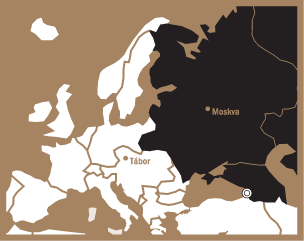 Armenia was the the first country in the world to establish Christianity as its official religion, in 301 A.D., and is renowned for its literature and architecture. Library of Congress, Prints and Photographs Division, Prokudin-GorskiiCollection, LC-DIG-prokc-21620. Digital color rendering by Jan Hubička based on color composite by Blaise Agüera y Arcas. 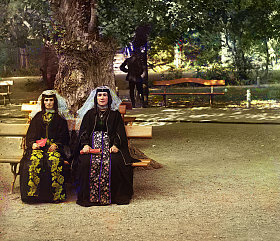 Armenian women in holiday dress. Library of Congress, Prints and Photographs Division, Prokudin-GorskiiCollection, LC-DIG-prokc-21485. Digital color rendering by Jan Hubička based on color composite by Blaise Agüera y Arcas.